Seems to work great for 80 million ps4 fans ,you know that 99% image quality for 35% more performance. Sure, sure. For just $1200, you too can run console detail levels. Turding is such a graphics "revolution". IQ has been significantly! improved by using DLSS in Port Royale....this comes in addition to the performance increase. Your ill-informed bashing of the raytracing features is getting old. DLSS just by itself isn't really down scaling but whatever. Combined in with the ray tracing it's simply doing something totally different in the first place. Is it getting old because after 4 months there is finally a benchmark with DLSS where it actually does something useful? I think you should hold your horses until there are at least a couple of games can use it too the way it is intended. The port royal benchmark change isn't DLSS as we'll see it in games. That's an image quality vs speed trade off. This is much more about showing the ray tracing working as the hardware people designed it to. Seemingly an absolutely pure win vs not using the tensor cores to do this. No surprise. NV's hardware people would never have devoted remotely as much die space to the tensor cores if they weren't very useful!! The real question is why it had taken NV's software people so long to even demo it. Or if/when it'll show up in games. That's the problem though: if it works well and it's a streamlined process why aren't we seeing it gain immediate traction with existing games? 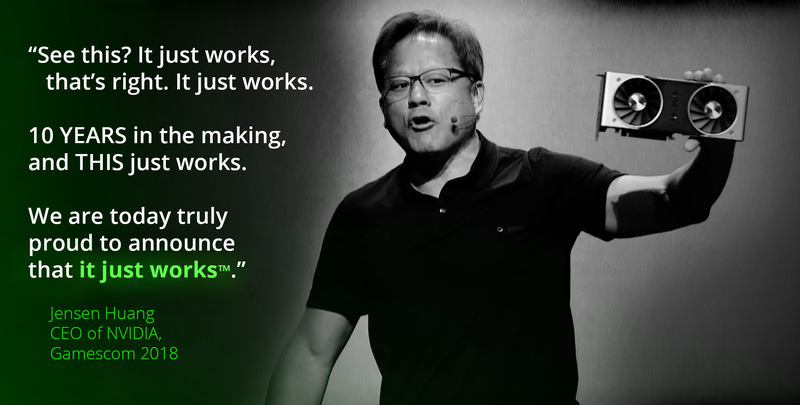 According to Nvidia the gains are fantastic (perf & quality) and yet we keep seeing demos instead of wide adoption. If I had to guess, probably because NV's isn't lining enough pockets? DX12 was the next coming of PC Gaming Jesus, and we're still in the sticks with it. I think the only game I own that the DX12 actually improves performance is World of Warcraft. And that's just sad. Exactly. I have yet to play a DX12 game that did anything better than running it in DX11. I think people are expecting things to just work and are forgetting that it takes a lot of work to get these features functioning like advertised, especially when they push more and more work on developers who don't fully understand what they're doing. I'd agree that you don't need RTX for Ray Tracing, but it certainly helps. Might make for a less irksome thread title if that last bit was added. Speaking of which, I wonder what happened to Tomb Raider Rise which was demo'd at that same convention? Months later after multiple game patches, still not a peep about RTX. DX12 is still a failure after how many years? I'm not surprised that raytracing is coming slowly. RTX won't be a selling point for years, if ever. - as long as dx12 is just putting "lipstick on a pig", eg. a fundamentally dx11 based engine and game we will never see the actual improvements possible. - Your hardware and that of reviewers is top notch. Remember mantle? Yeah if you were running a top notch CPU, the benefits were rather small but if you ran on something slower, the gains in fps were huge. So the benefit most likely is for older/slow 4 CPUs. - Has NV actually fixed their dx12 4-core limit? yeah for a pretty long time with NV gpu in dx12, it was hard limited to 4 cores. That would be a huge issue say in BF5 multiplayer. - Skill and budget. Doing dx12 right takes skill and time. Both cost a lot of money which it seems game studios have no interest in spending on their core employees, the programmers. High turn over. The guy that did the mantle implementation at dice has since left. And yes, 1 skilled dev leaving can matter a lot because it can make the difference of being able to do it or not.